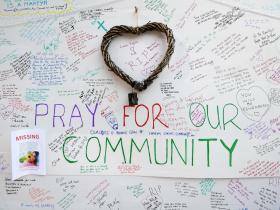 In a country and a capital city which have already seen more than enough tragedies, the devastation which is the Grenfell Tower fire scales a new level. In every news programme we see heart-rending, raw grief now turning to anger, strength and resilience alongside fragility and breakdown. We also see - again - the unimaginable, amazing bravery of our fire-fighters and other emergency services, and their understandable fatigue, and the solidarity, selflessness and compassion of thousands of ordinary people. But the fire has also laid bare the gaping inequalities in our country, exemplified by the inequalities in London's wealthiest borough, and so we also see tension and volatility: mingled with the communal cry of grief is an even stronger, angrier, desperate cry for justice and lasting change. we learn to adore and to abide in His love.